David knew that one should be prepared for anything when one climbs a mountain, but he never dreamed what he would find that June morning on the mountain ledge. There stood an enormous bird, with a head like an eagle, a neck like a swan, and a scarlet crest. The most astonishing thing was that the bird had an open book on the ground and was reading from it! This was David’s first sight of the fabulous Phoenix and the beginning of a pleasant and profitable partnership. The Phoenix found a great deal lacking in David’s education — he flunked questions like “How do you tell a true from a false Unicorn?” — and undertook to supplement it with a practical education, an education that would be a preparation for Life. 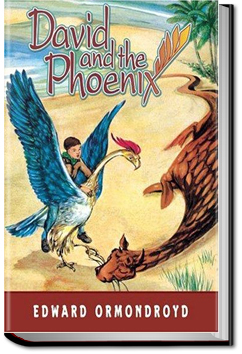 The education had to be combined with offensive and defensive measures against a Scientist who was bent on capturing the Phoenix, but the two projects together involved exciting and hilarious adventures for boy and bird. This entry was posted in Action/Adventure Books on April 1, 2016 by allyoucanbooks.